This competition is open to all current AAT students and full members. See below for the competition Terms & Conditions and application form. 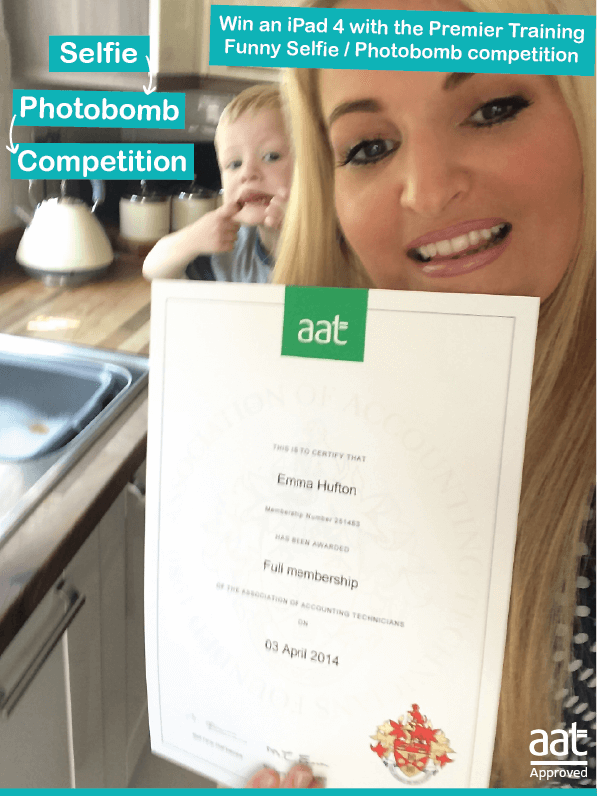 The subject for the Premier Training AAT Certificate Selfie / Photobomb Competition 2014 is to encourage students to celebrate and be proud of achieving their AAT certificates. 1. Entrants must be an AAT registered student or full member, their AAT subscriptions must be up to date and they must hold a valid authentic AAT certificate for any of the AAT qualifications or full membership in the photograph. 2. Entrants can only submit one photo, in colour or black and white. Images may be digitally enhanced. 3. All entries must be the original work and photo of the student and must not infringe the rights of any other party. 4. Entrants must not submit a photograph with any content that is directly or indirectly unlawful, harmful, threatening, abusive, defamatory, profane, vulgar, obscene, hateful, fraudulent, discriminatory, provokes or encourages violence or is racially, ethnically or otherwise objectionable. Any such entries will be disqualified from the competition and if necessary reported to the appropriate authorities. 5. Entrants must not have breached any laws when taking their photographs. 6. All entries will be judged by a member of the AAT management team. The judges will select a shortlist of three photographs (the 'Finalists') which, in their opinion, best illustrate the theme of the competition. They will consider a range of factors including composition, originality, and humorous appeal of the photographs. 7. There will be 2 runners up who will win £50 high street vouchers and one winner who will receive an Apple iPad 4. Prizes are non transferable and there are no cash alternatives. 8. Premier Training is not responsible for the technical customer service, aftercare, guarantee or warrantee of the prizes. 9. The entrants must be the sole owner of copyright in all photographs entered and must have obtained permission of any people featured in the entries. 10. By entering the competition all entrants grant Premier Training and the AAT the right to publish and exhibit their photographs on any social media platform, website, television or publication. 11. Entrants whose photographs are selected to appear in any social media platform, website, television or publication pursuant to paragraph 10 above grant Premier Training and AAT the further rights to publish and exhibit their photographs in print, on their respective websites or in any other media. No fees will be payable for any use of the entrants photographs. 12. Entrants whose photographs are one of the finalists also agree to take part in post-competition publicity. 13. By entering, entrants will be deemed to have agreed to be bound by these rules and Premier Training and the AAT reserves the right to exclude any entry from the competition at any time and in its absolute discretion if Premier Training or the AAT has reason to believe that an entrant has breached any these rules. 14. Premier Training reserves the right to cancel this competition or alter any of these rules at any stage, if deemed necessary in its opinion, and if circumstances arise outside of its control. 15. The competition closes at midnight on Sunday 30th November 2014. No entries can be accepted after the deadline. 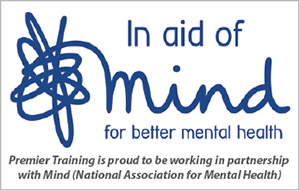 The winners will be announced on the Premier Training website and contacted in person by 12 midday Friday 5th December 2014. 16. No responsibility can be accepted for lost entries and proof of transmission will not be accepted as proof of receipt. 17. If the winner is unable to be contacted after reasonable attempts have been made, Premier Training reserves the right to either offer the prize to a runner up or to re-offer the prize in any future competition. Please enter the following code: To use CAPTCHA, you need Really Simple CAPTCHA plugin installed.